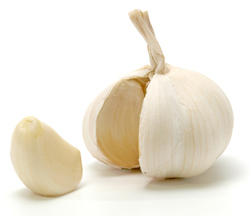 Garlic contains a substance that is particularly effective in encounters with even the hardiest bacterial strains. A young researcher at the University of Copenhagen will soon be defending his PhD thesis on the positive properties of the malodorous plant. Aggressive multi-resistant infections constitute an increasing health problem all over the world. Bacteria are developing resistance at an alarming pace, so new pharmaceuticals that can combat this threat are in great demand. Garlic contains so little ajoene that you would need to eat around 50 a day to achieve the desired effect. “We know that there is a potent chemical compound in the garlic plant that neutralises resistant bacteria by paralysing their communication system. My PhD thesis demonstrates that ajoene – the substance present in garlic – specifically prevents the bacteria from secreting the toxin rhamnolipid which destroys white blood cells in the body. White blood cells are indispensable because they play a crucial role in the immune defence system, not only warding off infection, but also killing bacteria,” explains Tim Holm Jakobsen, PhD Student at the Faculty of Health and Medical Sciences, who will be defending his thesis on 21 February. When bacteria clump together in what is known as biofilm – where they surround themselves with a tough film of organic materials – they become resistant to antibiotics. Researchers have been devoting much of their attention to Pseudomonas aeruginosa bacteria, which cause infections in patients with chronic leg ulcers, for example, and in the lungs of patients suffering from cystic fibrosis. “Ajoene supports and improves treatment with conventional antibiotics. We have clearly demonstrated this on biofilm cultivated in the laboratory and in trials involving mice. When we add antibiotics to biofilm they have very little effect, and ajoene alone barely makes any difference. It is only when the two are combined that something significant happens,” explains Tim Holm Jakobsen. Combination treatment with ajoene and antibiotics kills more than 90 per cent of the normally virulent biofilm. From a technical perspective, the ajoene blocks the communication system – known as Quorum Sensing – in the bacteria, which is used for purposes including creating infection. A large number of natural substances have proved extremely effective as medicines; taxol from the yew tree is used to treat breast cancer, for example, while artemisinin from sweet wormwood is effective against malaria. However, to improve on the original substances from nature – and to assure sustainable pharmaceutical production – researchers are working to augment natural materials through chemical synthesis. “Garlic contains so little ajoene that you would need to eat around 50 a day to achieve the desired effect. This means we have to pick up the ball from Mother Nature and run with it,” says Tim Holm Jacobsen, who hopes that the pharmaceutical industry will be quick to turn its attention to producing of the natural substance to which the research group currently holds the patent. “There’s a lot of money in pharmaceuticals for treating chronic illnesses such as diabetes, but if we are to win the race against bacteria, we need to bring new antibiotics into play. Nature is a great starting point for developing medicines – two-thirds of all new pharmaceuticals are based on natural substances,” concludes Tim Holm Jakobsen.